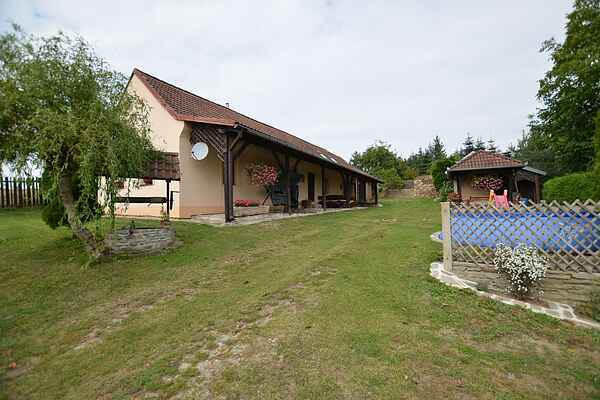 This beautiful, well-maintained holiday home with a swimming pool sits at the edge of the small, peaceful village of Dobřejovice, 13 km to the north of České Budějovice. Your charming holiday home is surrounded by a large, enclosed garden with a swimming pool and a covered terrace with a grill. You will also have access to the covered game area with table tennis and another game room with table football, which is directly connected to the house. Behind the home's garden, there is a large observation post for those who enjoy watching the wildlife. The kind owner will be happy to advise and assist you. The gorgeous castle of Hluboká stands just 5 km from the home. The cities of Český Krumlov, with its beautiful, historic town centre, and České Budějovice, with its Budvar Brewery Museum. The picturesque landscape of southern Bohemia is brimming with ponds. One of the most famous is Bezdrev Pond, near the city of the city of Hluboká.